An astronomical instrument at Subaru Telescope on Maunakea specifically designed to see planets around other stars has been successfully commissioned and has started to reveal stunning images of other worlds after almost a decade of painstaking work. "Maunakea is the best place on this planet to see planets in other stellar systems. Now, we finally have an instrument designed to utilize this mountain's special gifts and the results are breathtaking," exclaims Dr. Thayne Currie, who authored the first science result paper. While the first planets ever seen around another star were imaged from Maunakea, these discoveries were made with general-purpose instruments. With the commissioning of a new instrument at the Subaru Telescope called SCExAO (Subaru Coronagraphic Extreme Adaptive Optics, link to SCExAO team's website link to SCExAO project website), specifically designed and optimized for imaging planets by employing experimental technology, joins recently commissioned extreme AO instruments in Chile and Arizona. With SCExAO, Maunakea reaffirms its leading role in the direct detection and exploration of other worlds, eventually those that may resemble that of the Earth. 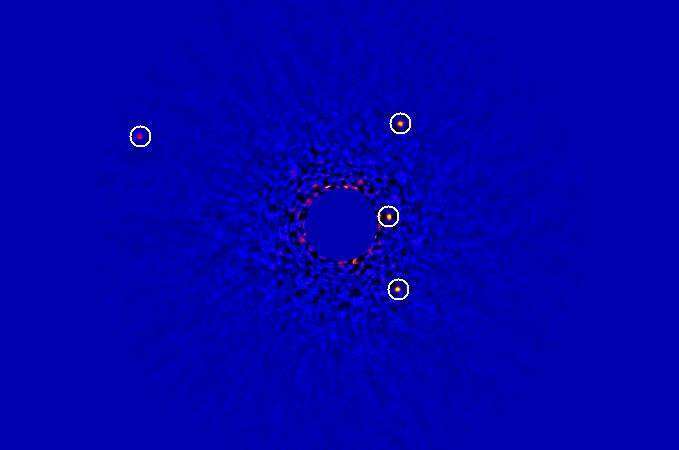 So far, about a dozen planets have been directly discovered by imaging techniques using current AO systems. The list includes two from the Subaru Telescope (kappa And b and GJ 504 b. These planets are 4 to 13 times more massive than Jupiter and located further from their host star than Neptune is from our Sun. 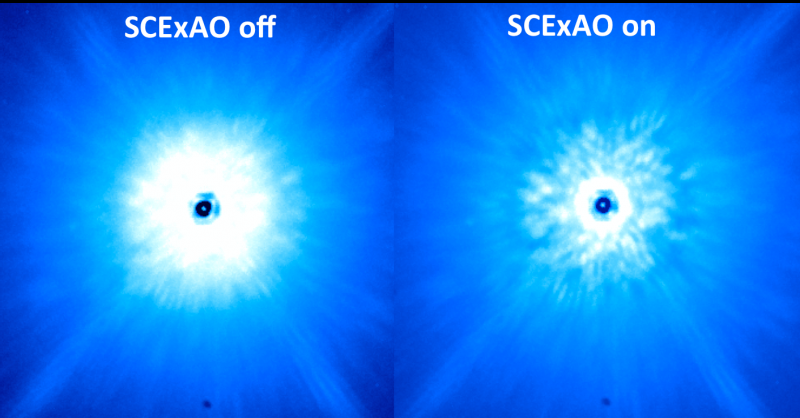 Being an extreme AO system, SCExAO allows us to image planets with masses and orbital separations much more like those in our own solar system by better compensating for the blurring of images due to turbulent air at the telescope site. Compared to the facility, multi-purpose AO system (AO188) at the Subaru Telescope, SCExAO is able to compensate more precisely for how the atmosphere blurs images of stars and does so at a faster rate. As a result, SCExAO now delivers far, far sharper images: with a reduced glare from the star, imaging fainter, more solar system-like planets becomes possible (Figure 1). SCExAO H-band (1.6 microns) data for the benchmark directly-imaged planetary system HR 8799, which hosts the first planets ever directly imaged, demonstrates the system's improved capabilities over facility AO systems (Figure 2). The planets around HR 8799 are faint at H-band compared to longer wavelengths. Existing facility AO systems such as the one at Keck or Subaru Telescopes so far detected two or three out of the four planets at H-band. However, SCExAO engineering data obtained in July 2016 coupled with the general-purpose HiCIAO camera easily detects all four of them and at a far better sensitivity. Follow-up SCExAO data obtained in Fall 2016 for HR 8799 with the new CHARIS integral field spectrograph resulted in even clearer detections of system's inner three planets and high-quality spectra that will allow us to diagnose the chemical composition of these planets' atmospheres. The most recent SCExAO/CHARIS data (obtained in December) suggests that the system has improved further, about as sensitive to detecting planets/planet-forming disks in one minute as the current facility AO systems would achieve in one hour. "With SCExAO, we know not only the presence of a planet but also its character such as whether it is cloudy and what molecules it has, even if that planet is tens of trillions of miles away," says the leader of SCExAO project Dr. Olivier Guyon excitedly. After just a few nights of having achieved true extreme AO capability, SCExAO made its first discovery. Last October, SCExAO revealed the first images of a debris disk around a star called HD 36546, a 2 solar-mass star in the constellation Taurus (Figure 3). The debris disk appears nearly edge on, is located about twice the distance from its star that the Kuiper belt is from the Sun, and is likely comprised of debris produced as a byproduct of icy planet formation. By comparing HD 36546's space motion to that for other stars in similar parts of the sky, the team showed that it is likely a member of a young association of stars born about 3 to 10 million years ago. 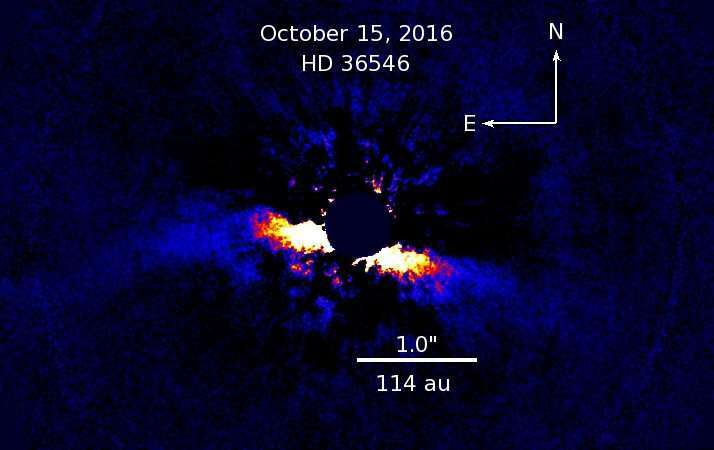 At such a young age, the debris disk around HD 36546 might be the youngest debris disk ever imaged and is a critical laboratory for studying the earliest stages of icy planet formation. Although SCExAO detected no planets responsible for sculpting this debris disk, it achieved planet detection sensitivities during this early stage of its development that rival/match the best planet imaging systems from other sites that have been fully commissioned. Dr. Nemanja Jovanovic who has been working on the instrument says, "We barely flipped the 'on' switch for SCExAO and already saw a new planetary system. The future, which includes a fully optimized SCExAO is extremely promising." The research paper describing the discovery of the HD 36546 disk is now accepted for publication in the Astrophysical Journal Letters. In 2017, SCExAO will undergo further improvements that will allow it to image even fainter planets orbiting much closer to their host stars. Combining SCExAO with an experimental detector scheduled for delivery in late 2017 will eventually allow it to discover planets 10 to 100 times fainter than those it can currently see, including mature planets in reflected light. CHARIS will continue additional engineering tests throughout 2017 to improve its capabilities. SCExAO, combined with either HiCIAO or CHARIS, is available for open use in 2017 for the worldwide astronomical community. Over the longer term, SCExAO on Subaru Telescope is a forerunner for the kind of exoplanet imaging instruments envisioned the next generation of large telescopes, in particular the Thirty Meter Telescope. Dr. Currie proclaims, "SCExAO is the type of instrument that will one day show us another planet that might be like the Earth. This is the kind of new knowledge that makes Thirty Meter Telescope worth it for Hawaii."